Well, it’s official: Reality television IS where souls (and brain cells) go to die. E! 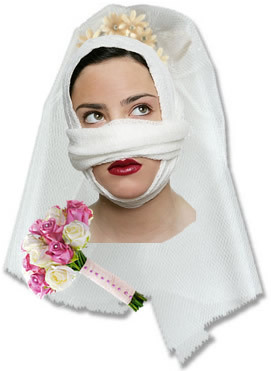 has leaked word of their latest in a long line of painful examples of the worst humanity has to offer: Bridalplasty. For the few North American women *not* filled with self-loathing and insecurity, this show seems hell-bent on having you join the fray. In this newest bit of creative brilliance, brides-to-be are pitted against each other to compete in wedding-themed (I’m guessing cake decorating, dress designing & the writing of wedding vows that will, no doubt, cause angels to weep) challenges. And the grand prize these mentally stable ladies will be competing for? Plastic surgery. For real. Actually, the wording in the press release is “extensive surgical procedures.” WTF! And I thought paying someone else to do my makeup for me (I didn’t, for the record) was a bit excessive. From the limited information I’ve read, it sounds like Bridalplasty is set to be a cross between Bulging Brides, Survivor & The Swan (remember that abhorrent bit of Must-See TV? ), wherein one woman gets booted out of the house (which I can only assume will be wired to the rafters with cameras so as to capture each and every second of bitchy melodrama & catty smackdowns) each week, while another wins one cosmetic surgery procedure of her choosing. And then the last bride standing not only gets her “dream wedding,” but she also wins her entire “wish list” of plastic surgery. And just to make it extra special, her big reveal comes… as she walks down the aisle. Are you effin’ KIDDING me?! She goes under the knife for her “extensive surgical procedure” and THEN her groom-to-be bears witness to the results as she’s walking down the aisle. Will the show also provide her with a name tag so he’s sure to recognize her? I guess we shouldn’t be too terribly surprised. These are the same great minds responsible for VH1’s The Surreal Life and Rock of Love. This entry was posted on Tuesday, September 21st, 2010 at 12:20 pm	and is filed under Wedding WTF. You can follow any responses to this entry through the RSS 2.0 feed. You can leave a response, or trackback from your own site.